Democratic Congressman Sam Farr visited a UCSC politics course on Friday, talking shop and fielding questions from students before urging them to register and to vote. Were trying to sell democracy all over the world, but the world questions whether we believe in our own system, said Farr, who represents the 17th district in the House of Representatives. 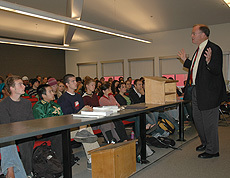 Farr spent about 45 minutes with students in Politics 120A, Congress, the Presidency, and the Court, an upper-division class taught by politics professor Daniel Wirls. Farr then met with a few faculty members and campus officials, including Acting Chancellor Martin M. Chemers, before attending a student gathering at the Quarry. As the Nov. 2 election nears, Wirls and fellow campus experts in U.S. politics agreed that the presidential debates had resuscitated Kerrys candidacy. The greatest irony of the debates is how important they were despite rampant early skepticism about the highly structured format, observed Michael Brown, professor of politics and chair of the Politics Department. Analysts and public-opinion polls agreed that Kerry dominated all three face-offs, but Kerrys strategy was different during the final confrontation, according to Brown. During the first two debates, Kerry played to the center and was campaigning for undecided voters, said Brown. By the third debate, Kerry was playing to the base of the Democratic Party. Although negative campaigning drives down turnout, both Brown and Wirls predict voter turnout will be higher Nov. 2 than in recent elections. This is a campaign in which the divisions and stakes are drawing people in, said Brown. Both campaigns have waged energetic voter-registration drives and are preparing major get-out-the-vote efforts, which may prove decisive in a presidential race that remains too close to call, said Paul Ortiz, an assistant professor of community studies and a voting-rights expert. But Ortiz expressed deep concerns about the integrity and security of the U.S. electoral system. As reports of intimidation and voter suppression come in from around the country, Ortiz noted that delegations of volunteers are organizing to keep an eye on the polls.